I must have walked past this window in St Andrews hundreds of times but I only noticed it recently. 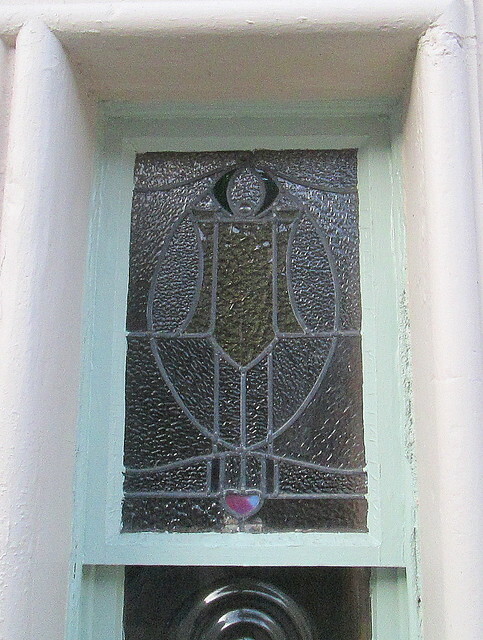 The buildings are generally very old but this is obviously an Art Nouveau/Arts and Crafts window, somebody did a bit of refurbishment over the years. 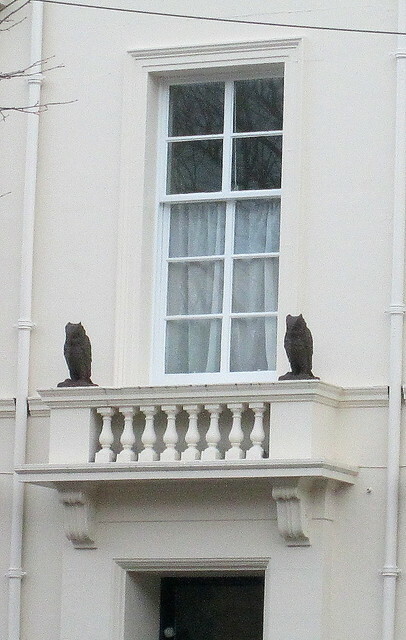 Across the road I noticed the stone owls sitting on the edge of the portico. I think that like many buildings in St Andrews this one is owned by the university, so presumably the owls are symbolic of wisdom and learning. 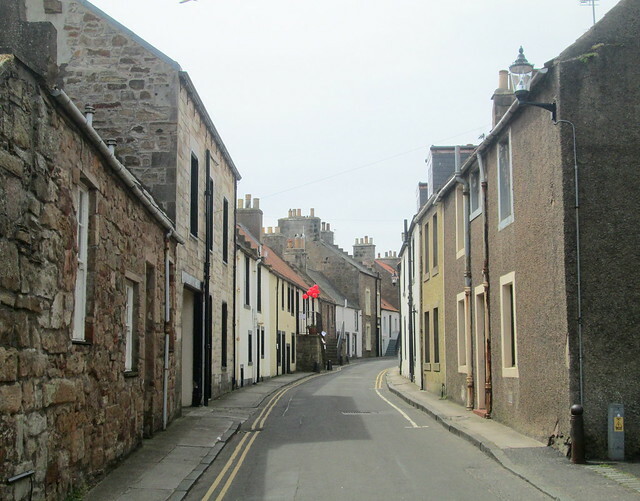 It’s rare to see an empty street nowadays, they’re usually full of parked cars on both sides of the street, but on their Open Arts Festival in Cellardyke, a coastal village in Fife, the place was deserted of cars for once. The clutch of red balloons being the only evidence of modernity, denoting where an artist was exhibiting work. 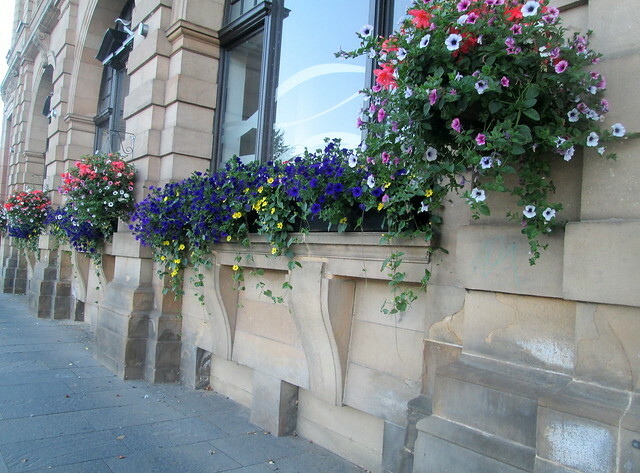 I took the photo below in the fair city of Perth, the hanging baskets and window boxes were looking so lovely. I think the rather grand looking building was a bank originally – remember them?! 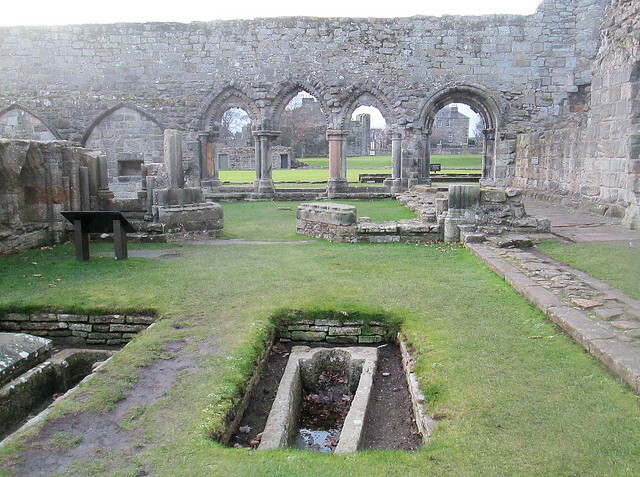 I have visited the small town of Dunkeld hundreds of times as it’s one of my favourite places, but I had only ever been into the cathedral ruins there. The photo below is of the newer cathedral which is obviously still in use as a place of worship. 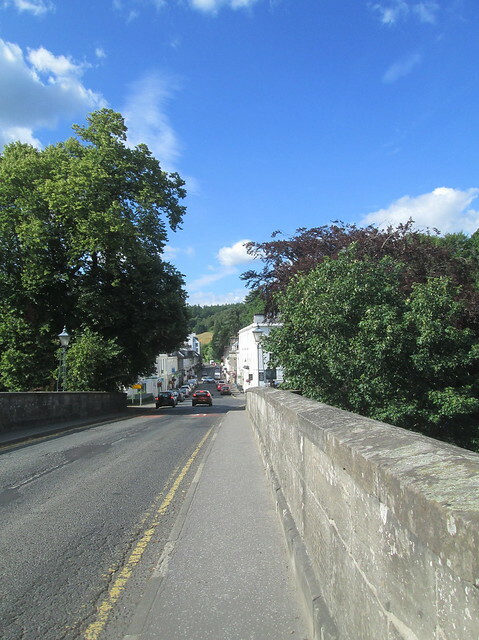 The photo below is the view of Dunkeld that you get as you drive over the bridge. 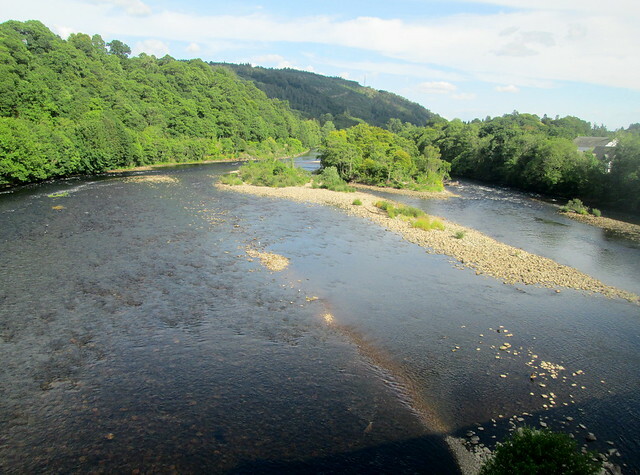 After visiting the cathedral I walked over the bridge to get a photo of the River Tay. I’ve never seen it so low before, there were actually people walking out to the ‘islands’. I bet it was still cold though! 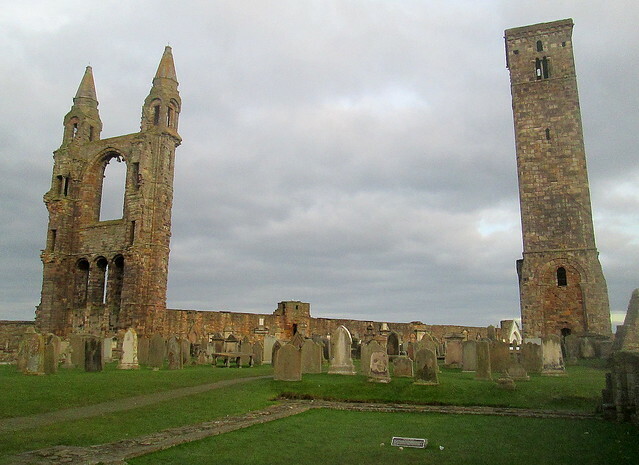 The photo below is of St Andrews Cathedral ruins and St Rule’s tower, they look quite small in this photo for some reason, they are in fact large and quite imposing – for ruins. Going up the spiral stairs is an interesting experience involving metal stairs first before you get to the old stone spiral ones. There are apparently 156 steps and I’m just really glad that we didn’t meet anyone coming down as we were going up, they’re very narrow and trying to get past strangers could be quite embarrassing! 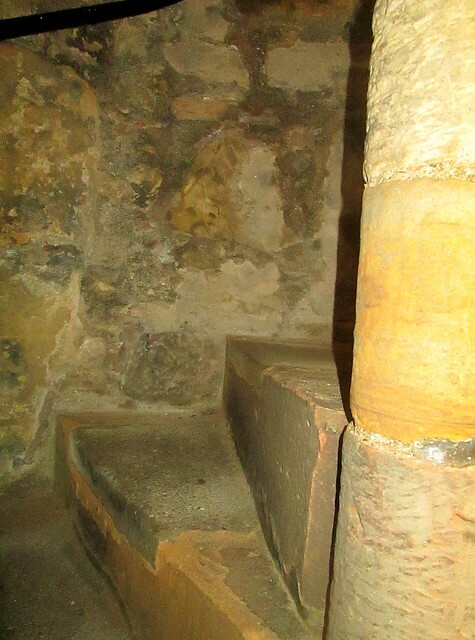 You can get more of an idea from the photo below of how the underside of the stairs looks. I think most of us spend time visiting far afield places before getting around to seeing nearby tourist attractions. 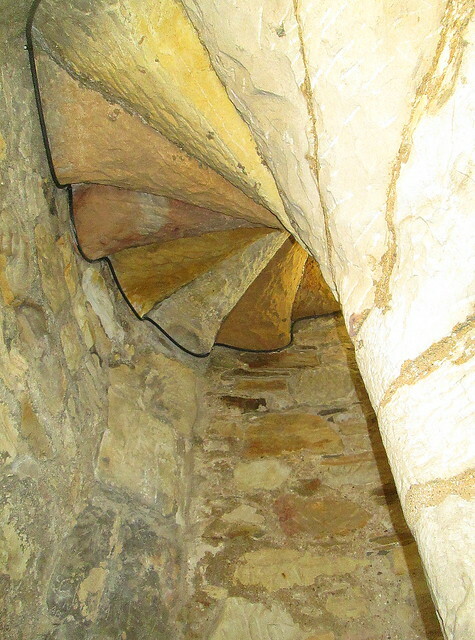 That’s the reason it has taken us about 40 years to get up St Rule’s tower which is in St Andrews Cathedral’s grounds, and I have to say that half-way up the narrow spiral staircase I wished we had tackled it at least 20 years ago as I thought I was never going to get to the top! 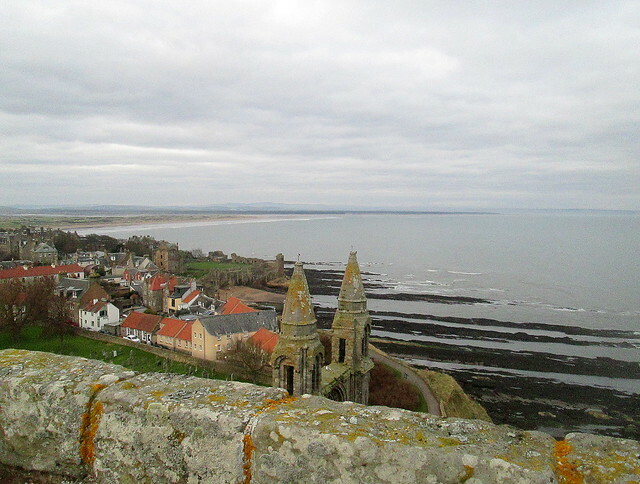 But it was worth it to get the view which is great even on a dull day. 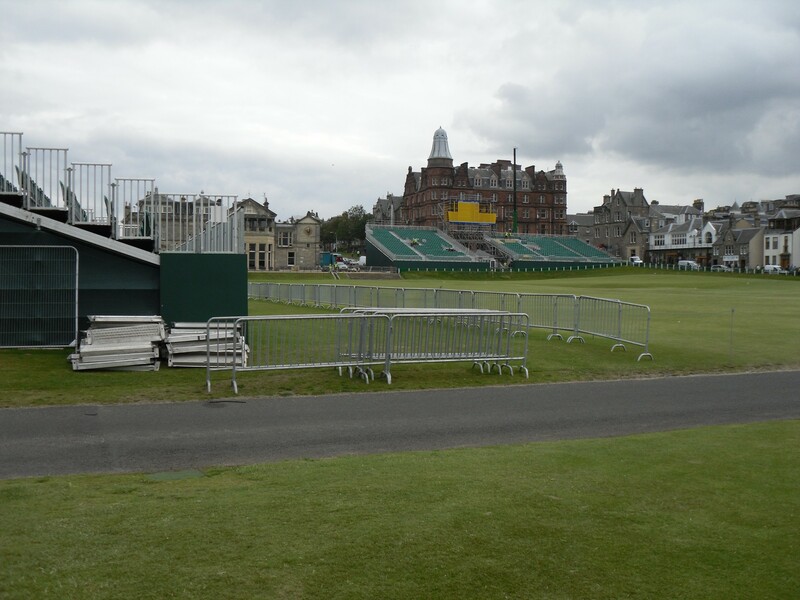 The famous Old Course is over towards the right in the distance of the above photo and to the left in the photo below. From the other side of the tower you get a view of the harbour. The cathedral was badly damaged during the Wars of the Three Kingdoms as the English Civil War is more correctly described nowadays, but if you have a good imagination you can see that it must have been quite some place in its day. Below is a view of what’s left of the Chapter House and some stone coffins, in those days they chiselled out the shape of a body as you can see, an awful lot of work for the stonemason, it seems they didn’t want the body moving out of position. 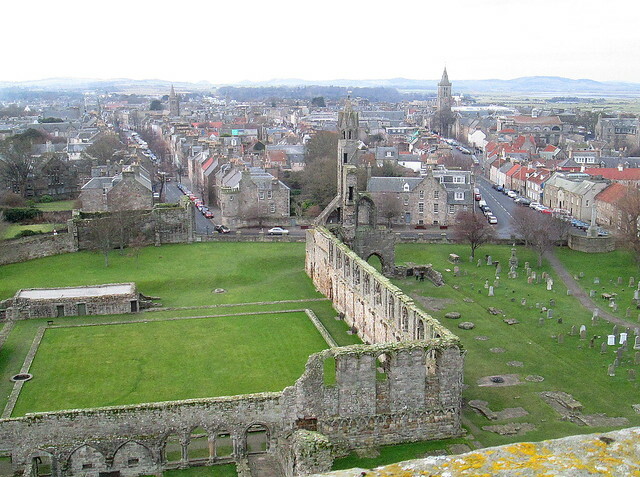 The view of the town of St Andrews that you get from the top of the tower is probably clearer than you would have got in medieval times, certainly in winter when all of the chimneys would have been belching out smoke. There were only two chimneys doing that when I took the photo but they were making plenty of pollution. You have to be fairly fit to make the climb up the tower! 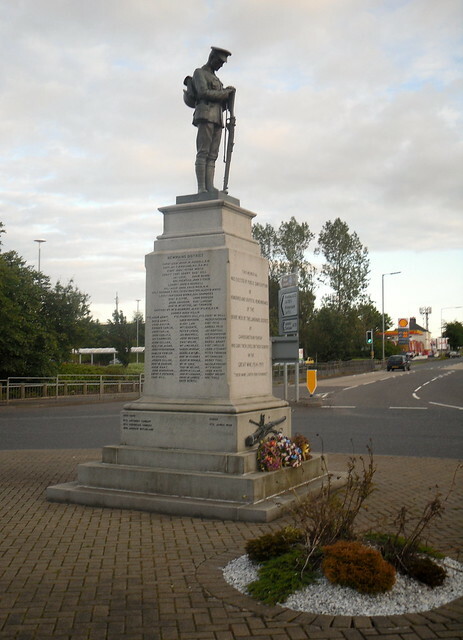 Every teeny village that you go through in the UK has its own War Memorial, and sometimes there are memorials in the middle of nowhere, commemorating the men who lived in far flung rural areas with no community focal point. 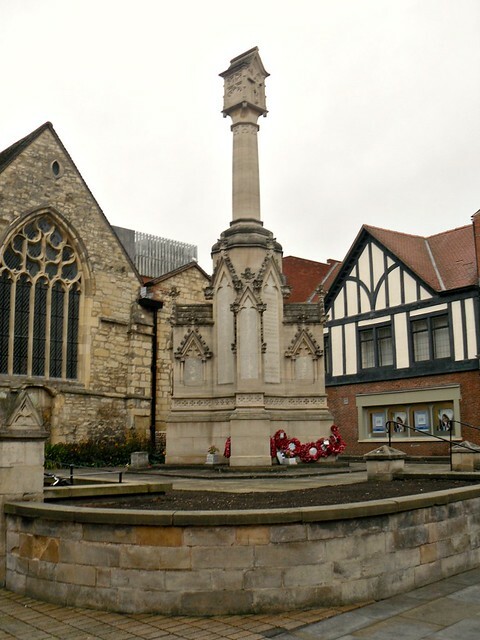 There are lots of different designs to the memorials, and if it’s possible to stop we always do so that we can read the names, and Jack takes a photo of them. Here are just a few he has taken over the years. I must admit that I’m not really a cat person, although I do like the look of ginger cats ( I wonder why that is!) I’ve never owned a cat – actually I believe that cats aren’t owned by anyone it’s probably more like they own people. 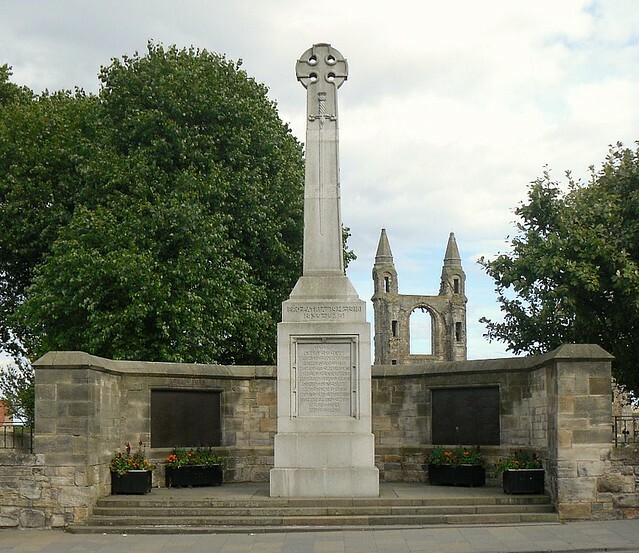 However I did like the idea of a town having a cat, like Hamish McHamish who lived his life out in St Andrews in Fife. He was a great favourite with everyone, especially the students, but sadly he succumbed to a nasty chest infection and had to be put to sleep recently. Susan McMullen wrote a book about him called Hamish McHamish – Cool Cat About Town. You can see images of Hamish McHamish here. Below is a photo of Hamish beside his bronze statue. 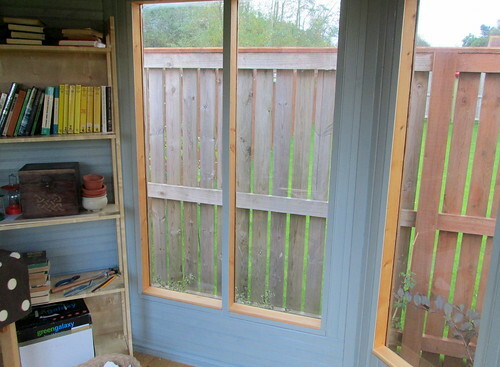 The summerhouse/shed has been an ongoing project for a while now as you can see in the photo below I still had some painting to finish. The colour of the paint is not at all what it was supposed to be, I wanted something more greenish and less shiny but it’s blueish and I’m getting used to it. 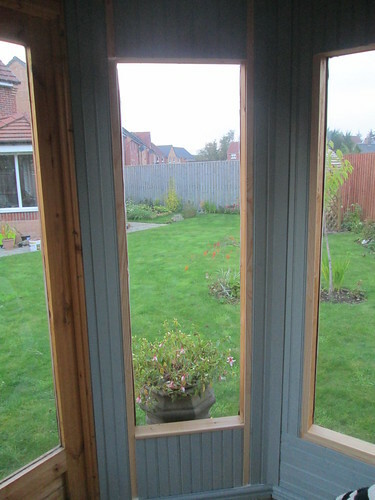 The garden fence which you can see has since been woodstained. All of the fence which you can see in the above photo has been painted now too and as you can see although it’s now autumn there’s still quite a lot of colour in the garden. 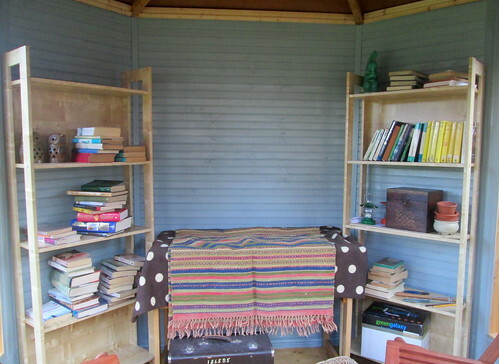 I’ve just dumped some books and stuff in there, between the bookcases there is a sewing table/desk underneath the covers and I intend to put my old hand cranked sewing machine on that, you can just see its case, it was obviously originally owned by someone in the RAF. 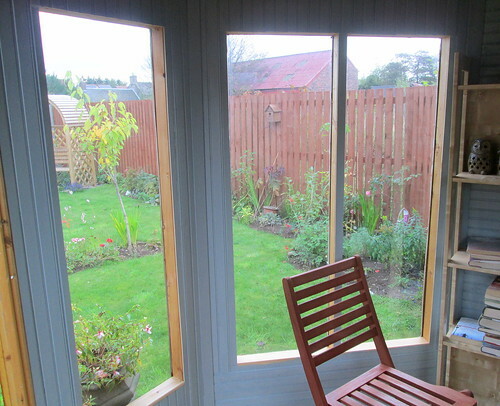 After all the painting of the summerhouse and the fence I was in dire need of going anywhere away from the smell of paint. A trip to St Andrews fitted the bill nicely and as you can see it was a beautiful day. 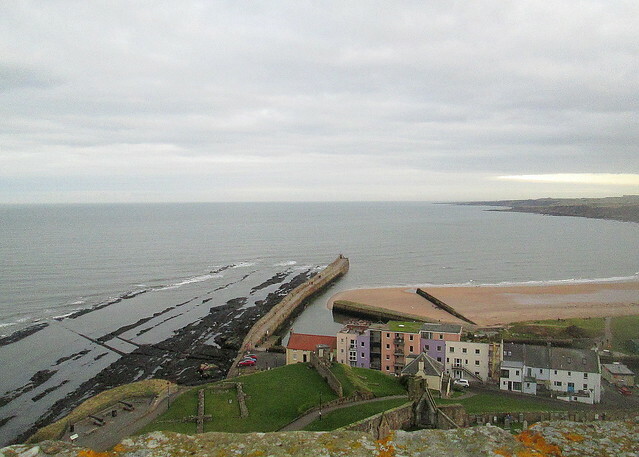 We walked down to the beach where there were actually a few hardy souls wild swimming and I took this photo from there looking over the harbour to the town on the far side. It was a gorgeous sparkling autumnal day and actually quite warm, about 60 F or more. As usual we went to the secondhand bookshop and amazingly I didn’t buy any books, but Jack bought two; Ringan Gilhaize by John Galt and Wish I Was Here by Jackie Kay. One gorgeous day last week we decided to take ourselves off to the lovely mediaeval university town of St Andrews, a favourite place of mine, you can see images of the town here, but first we stopped off at the St Andrews Botanic Garden. 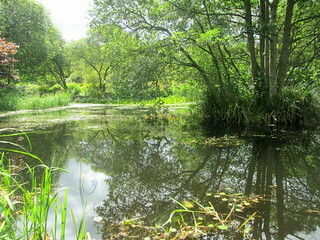 Jack had prepared a picnic lunch (he’s not a bad lad) and these two photos are of the view from our picnic bench. 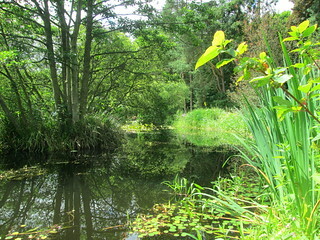 The pond was alive with life but luckily none of it was biting. 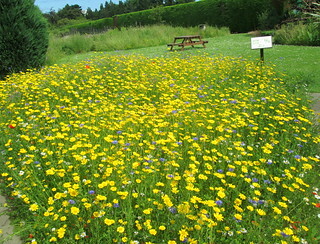 The bit of land below has been set aside as a wildflower meadow. 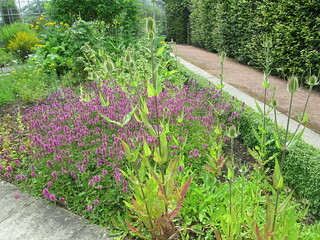 There’s also a herb garden and they sell a lot of unusual herbs at the Botanics shop, as well as some very fresh (just dug up) produce from the vegetable garden. 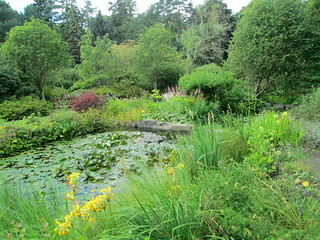 Below is a lily pond. 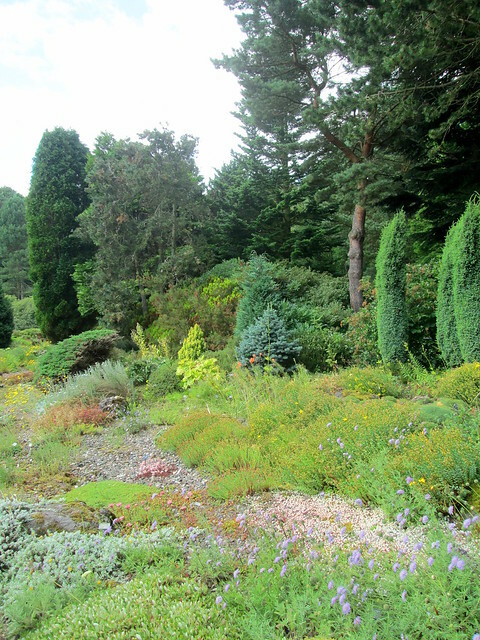 Below is part of a rockery, alpine garden. 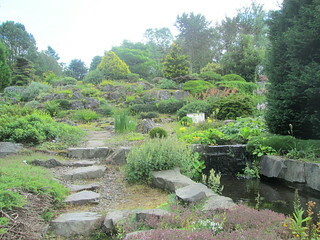 More rockery/scree garden. I must admit that I’m tempted to create a mini rockery in my new garden. Remember they were all the rage in the 1960s? everything comes back around! I would have to scale it down more than a wee bit, there’s no way I could cope with rocks the size of the ones above. Last year I and a lot of other people signed a petition to try to keep these gardens open to the public as they were under threat of closure, due to cutbacks I think. You can read about it here. 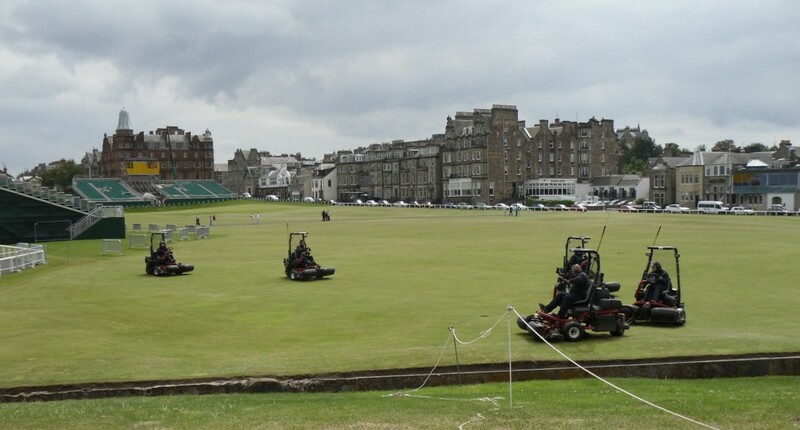 They’ve got a reprieve for the next five years anyway, but given the huge price of land around the town (due mainly to golf) I have no doubt that at some time in the future someone will try to grab it again for building purposes. If so, I’ll be lying down in front of a bulldozer! 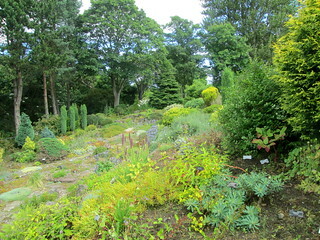 I hope you enjoyed your armchair trip to the St Andrews Botanic Garden. We had intended going to Edinburgh on Saturday to visit the Royal Yacht Britannia but the weather has been terrible for about a week now with howling gales and I didn’t fancy going over the road bridge. It was closed to high sided vehicles which means that our wee car would be buffeted about on the bridge – scary! 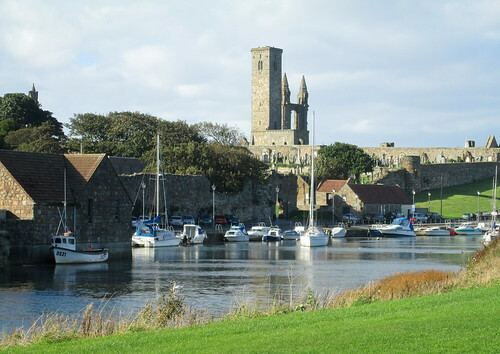 So eventually we ended up in St Andrews, just to get out of the house really. I have a horrible feeling that we’ll be battening down the hatches soon when the ice and snow get here so we might as well go out while we still can. This window sign amused me. 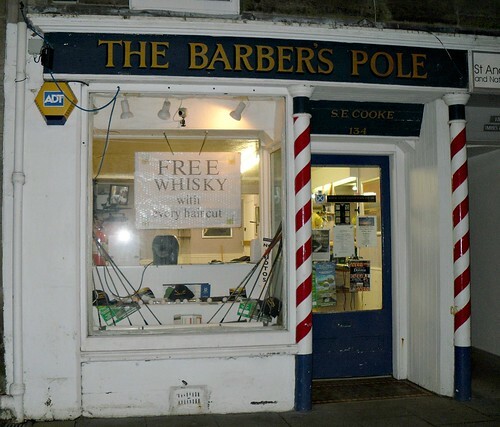 Surely only in Scotland would a barber try to get your custom by offering you free whisky. Mind you, I think it’s a brilliant idea because not only will they probably get more customers – they’ll also be less likely to complain if they don’t like the haircut – because of course they’ll be ‘half-cut’ or semi drunk! 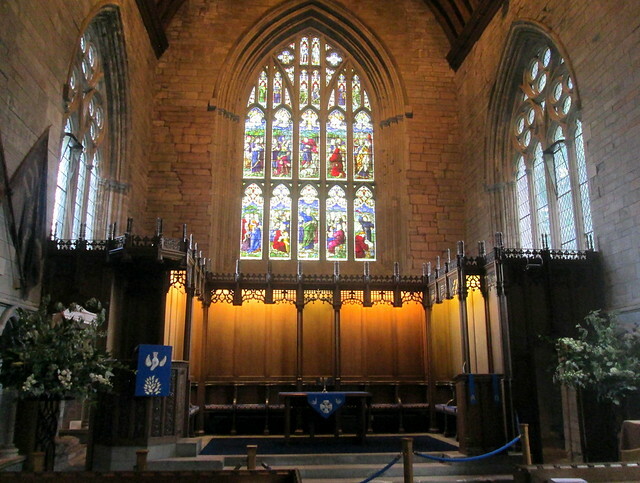 The long things in the window are golf clubs – well it is St Andrews! Some first year students from the University of St Andrews have been having some fun making a spoof video and declaring their love for Kate Middleton. If you want a bit of a laugh have a look! It’s all filmed in St Andrews but I have to say that I’ve never seen the North Sea look as manky as it looks in this video! If you look closely you’ll be able to see the second-hand book shop which I should be banning myself from entering for the rest of the year. Well the town was taken over by the media and security people and I was told by a certain son of mine who works at the uni that they wouldn’t be doing a walk-about, so I didn’t bother going. To be honest though I would have had to get on a bus and I’ve already been on one this week. Believe it or not at 8.30 this morning it was chucking it down with rain and that was the clincher in my decision not to go to St Andrews. Anyway, if you’re interested in William and Catherine’s visit and launch of the 600 year anniversary celebrations and appeal there are 50 photographs of it which you can view here. 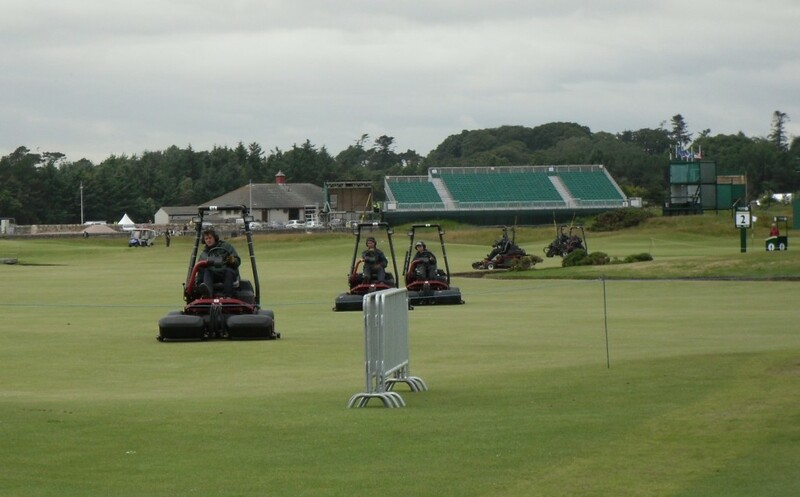 We had a day out in St Andrews last Tuesday and as you can see the preparations for the British Open, which starts later this week are well underway. The lawn shavers were out in force but I honestly couldn’t see any grass being trimmed off at all. Amazingly, members of the public were just wandering around the fairways, or should I say the hallowed ground. Previously I had thought that someone might have taken a pot-shot at you if you did that. Mind you, I find it very difficult to walk on grass when it is that well tended green velvet sort so I kept to the path. This photo is from nearly the same place as the one in a previous post, showing the difference. We had a nice lunch at The Central pub after we had been around the book shops. At first I thought it was going to be slim pickings but I ended up getting quite a book haul. 6. The Mystery Mile, The Crime at Black Dudley and Look to the Lady – a Margery Allingham omnibus. I’m fairly sure that I read the du Maurier one in the year dot but possibly not, so I want to read it to complete her works. Coincidentally I read in The Guardian on Thursday that their columnist Deborah Orr had just finished reading the Chesterton book and had really enjoyed it. I’m probably the last person in the reading world to get around to The Guernsey Literary Potato Peel Pie Society Book but as it is set during the German occupation there, I think I’ll be reading this one soon. I don’t want to know how many books I have in my TBR queue now, but it isn’t anything like 600 – I hope!